Syrian air defense batteries respond to what the Syrian state media said were Israeli missiles targeting Damascus on January 21. Iranian aggression and Israeli air strikes force the issue for Syria. On January 20, Iran’s Quds Force launched a ballistic missile from the outskirts of Damascus. According to the Israel Defense Forces (idf), the target was an Israeli ski resort in the Golan Heights. Hundreds of tourists were visiting at the time, and some captured footage of the incident. Israel’s Iron Dome antimissile system successfully intercepted the Iranian-made rocket. Many skiers immediately stopped after hearing the Iron Dome engage and saw the interceptor missile pass overhead. Iran claims the attack was a response to Israeli air strikes earlier that day. Israeli intelligence asserts that the attack had been planned long in advance and approved by the Iranian regime. 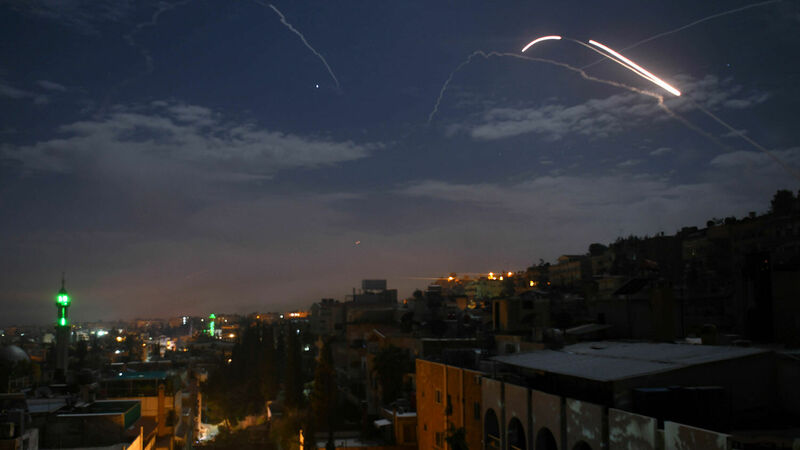 In response to the missile, the Israeli Air Force retaliated with three waves of air strikes against Iranian intelligence facilities, weapons warehouses and a training camp near Damascus. The strikes hit four Iranian sites and six Syrian anti-air defense units. Eleven people were killed in the air strikes: seven Iranian troops and four Syrian soldiers. On January 21, the idf released news of the attack and video footage of an air strike on a Syrian air defense unit and posted it on social media. The Israeli air strike came hours after a Syrian cargo plane from Tehran landed at Damascus International Airport. Israeli Lt. Col. Jonathan Conricus said that over the past two weeks, Iran has been shipping weapons to the Quds Force main storage hub near the airport. From there, the weapons are distributed to Hezbollah’s terrorist army and other Shiite militia groups in the region. Another flight from Iran was en route to Damascus, but it turned back after the report of Israeli air strikes. Since the Syrian civil war began in 2011, both regional and global powers have sought participation in the war. What began as a conflict between revolutionaries seeking to overthrow their government and those seeking to keep Syrian President Bashar Assad in power quickly became an international proxy war for powers trying to advance their interests in the region without expending personnel or political capital directly. In 2014, Iran saw the rise of the Islamic State as an opportunity. Under the facade of battling terrorism, Iran sent Shiite militias to battle the Sunni group, and to entrench themselves in the region. Iran seeks to control the Shia Crescent, a large corridor of land spanning from Iran, through Iraq and Syria, to its terrorist proxy in Lebanon on the Mediterranean Sea, Hezbollah. Control over this area would allow Iran to continually supply its various proxies with armaments, including ballistic missiles. Control of Syria is vital to its goal, but one base lies in its way. On December 19, United States President Donald Trump announced the withdrawal of America’s 2,000 troops in Syria, many of whom are stationed at the Al-Tanf military base in southern Syria. The U.S. has enforced a 34-mile radius semicircle demilitarized zone around the base. Any unauthorized entry into the zone was quickly dealt with by the U.S. military. This strategic base sits directly in the way of Iran’s coveted highway. The Al-Tanf is located in the region U.S. troops are set to retreat from, but it is still unknown who will replace the U.S. as the keeper of the Al-Tanf. Even though Iran fired the missile and Israel launched the air strikes, Israel holds Syria responsible for the violence. The idf statement said that the rocket was launched “from inside territory that [the Syrian government] promised would not host an Iranian presence.” To Israel, the Iranian presence exists because the Syrian government allows, or even encourages, it. The nation of Syria has already been torn apart by eight years of civil war. Continued Israeli air strikes won’t help Syria rebuild. The United Nations reconstruction plan is estimated to cost $388 billion. Syria doesn’t have that money, and the number is only going to increase with each Israeli air strike. Despite direct warnings, Syria sought to defend the Iranians and its defense infrastructure paid a price. The new Syrian battlefield is being drawn on a canvas of increased Syrian government responsibility. In 2017, Israel revealed it had carried out 100 air strikes against weapons transfers in Syria. In 2018, Israel stated this number had increased to 200 air strikes. Israel is unlikely to stop these air strikes anytime soon, but will instead look to increase its activity in the region. Syria finds itself in a dilemma: The Syrians could keep enduring air strike after air strike from Israel, or if Syria wants to rebuild, it could get rid of the problem by kicking Iran out of Syria. Syria has been caught in the crosshairs and is paying the price of harboring Iranian militias. Will Syria finally decide to kick Iran out? It does seem to be Syria’s best option. The Bible prophesies of this coming Iran-Syria divorce. A prophecy in Psalm 83 lists several moderate Arab nations that will ally themselves with a German-led European Union. “For they have consulted together with one consent: they are confederate against thee: The tabernacles of Edom, and the Ishmaelites; of Moab, and the Hagarenes; Gebal, and Ammon, and Amalek; the Philistines with the inhabitants of Tyre; Assur also is joined with them: they have holpen the children of Lot. Selah” (Psalm 83:5-8). The Hagarenes were a semi-nomadic people who lived in the desert region between the lands of Gilead, Bashan and the Euphrates River, which is now known as Syria. They are mentioned as living in the same region during the 600s b.c. When the Psalm 83 prophecy says the Hagarenes will be part of the Arab alliance, it is actually referring to the modern-day nation of Syria. Notice Iran is not part of this alliance. This shows Iran will not be in control of Syria. Instead, Syria will be looking to Germany and the European Union. Europe is already becoming more involved in Syria; it recently attended a meeting in Istanbul to discuss the condition of Syria going forward. As Syria faces its tough dilemma, watch for it to turn against Iran.